So when you say new Jazz you mean a facelift? No, when we say new Jazz, we mean a whole new generation of car, brimming with modern technology. 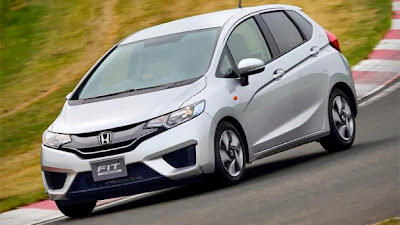 The car that you see here is the third generation Jazz that is already on sale in Japan (as the Honda Fit). It will share its underpinning with the new City (launching in India on 25th Nov) and the Vezel crossover we saw at Tokyo motor show. It looks pretty fresh but what’s with the broad grille and where’s the chrome? The in-your-face grille along with the rest of the car follows Honda’s new ‘Exciting design language’. We are not making it up, that is what the theme is actually called. As you can see the Jazz does sport a very modern look. The exterior design exudes spaciousness and still manage to look sporty at the same time. The version that we drove is meant for the Japanese market, so the lack of chrome is understandable. In India expect the big front grille to be drenched in chrome to suit our taste. Okay so we know what to expect from the outside but how does the Jazz feel from the inside? Stepping into the Jazz you still have that feeling of space like the older car. Again, the one we got to drive was a Japanese model, but we expect beige to be on the menu when the car comes to India. The cabin too feels modern especially with the feather touch temperature control; but sadly that might be skipped for the Indian edition to keep costs in check. Versatile packaging was the strength of the last generation Jazz, and this one will be no different. With a large boot and split rear seats you won’t have to choose between your passengers or their luggage. Does the motor feel anaemic like the older Jazz or can we expect anything better? We drove the Jazz around Honda’s Twin Ring Motegi circuit, Japan. The 1.5-litre petrol motor fitted in the Japanese version feels peppy. As this was a track we could not exactly feel how the suspension would behave on our roads. Having said that, the drive was sporty and the car felt well-planted at regular cornering speeds. Thanks to the tax structure in India, Honda will unfortunately re-tune the 1.2-litre motor from the earlier generation Jazz and nestle it in the new one. We are guessing and hoping the petrol motor will be engaging to drive unlike the old car. But the good news is that there will also be the 1.5-litre diesel engine variant (from the Amaze), that should pack the punch while being highly fuel-efficient. Seems like a good package already, when can I buy one? For now, Honda is focusing on the City that is due to have its world premiere this Monday in Delhi. Once things settle down with the City, we expect to see the Jazz making its return by mid-2014.